Eurocare provides a specialist sharps disposal services to allow you to safely dispose of all medical sharps including hypodermic syringes and scalpels. Sharps must be disposed of safely at all times. There is clearly a foreseeable risk that used syringes may be left or hidden in areas such as public toilets in stores. This presents a danger to the general public and a danger that any business needs to guard against to prevent injury and potential legal action. The most serious risk is of catching a blood borne infection if there is a puncture injury. Hepatitis B is the commonest infection risk but there may also be a chance of exposure to Hepatitis C or to HIV. Sharps must be disposed of safely at all times. Eurocare offers a supply only of sharps bins and a disposal service whereby the waste generated is removed from site for safe disposal. 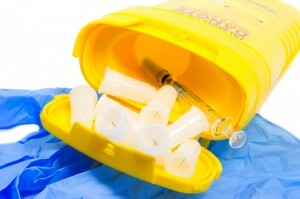 We offer a range of UN 3291 approved sharps disposal containers tailored to meet all requirements and levels of usage. Sharps containers are available in 0.6, 4, 7, 13 and 24 litre sizes. All sharps containers are made from polypropylene, and are puncture, impact, fluid and solvent resistant, offering complete protection for users. Colour coded sharps are provided to segregate your sharps waste streams. These containers are collected on a regular basis to suit your needs.